René Ormae-Jarmer leads the the Kingsman Thunder Drum Line in a recent practice at Rex Putnam High School. René Ormae-Jarmer has been playing music for as long as she can remember, and she’s just opened up a studio that corners the market on women who give drum lessons in the Portland area. She was exceptional even as a toddler, when she would bang out original songs at the piano while her friends wanted to play dolls or house. By the time she got up to the fifth grade, music programs were still strong enough in public schools those days so that all students were asked which instrument they wanted to play. “I would yell ‘Drums!’ because I wanted to make noise, but they would hand me a set of bells, and I just cried,” Ormae-Jarmer said. In spite of early setbacks, she learned the basics of notation and rhythm throughout grade school and middle school. Impressing the Rex Putnam High School band director of the late 1970s with her reading and versatility, she found talent for playing standard school percussion instruments, reading rhythms and marching in parades. While her father also encouraged her with the gift of a new blue-sparkle made-in-Japan drum set from Sears, Roebuck and Co., fellow students (all male) weren’t so sure. What she lacked in technique she made up for in passion for playing her drum set, so she had a tough time breaking into the scene as her classmates made her carry around their heavy equipment. But becoming the only female drum teacher in the metro area now has its advantages. “I’m probably the only drum teacher who gets to tell female students not to play like girls because you need to hit the drums hard and girls are always being told to be dainty,” she said. Playing like a girl is a running joke that Putnam pep-band students find hilarious, citing a stereotype that women should end up playing the flute. Drumming loudly has always been a weakness for Putnam sophomore Becky Lauer, who started playing in the fifth grade and is now a bass drummer for the Kingsman Thunder Drum Line. “Wearing the harnesses and marching is physically demanding, but there’s no reason that girls can’t do it as well as guys can,” Lauer said. Ormae-Jarmer’s students at Putnam must have an ear for rhythms and be willing to wear navy-blue marching pants. She also gives private lessons in her new home studio and at dozens of other Portland-area schools, including at Canby Middle School and Kraxberger Middle School in Gladstone. Putnam junior Daniela Soto noted that there was a danger in going from the bass drums to the snares during her second year. Attending Clackamas Community College, Ormae-Jarmer brought her skills with mallets, rudiments and reading to a new level with the famous Northwest percussion teacher Don Worth Sr. During more than 18 years of teaching, her focus has always been to get students to work together. “When we’re not paying attention and letting the music go, she really tacks us down and makes us focus,” said tenor drummer Jacob Hogan. “I’m not task-mastering you because you have to listen to each other, and that’s certainly how it’s going to work out in the field,” Ormae-Jarmer told her Putnam students. After first trying to learn by ear the entire Police album “Outlandos D’Amour,” she had taken lessons from Portland punk-rock legend Sam Henry. During her sophomore year at Putnam, she joined a band with a fellow percussionist and classmate Michael Jarmer. 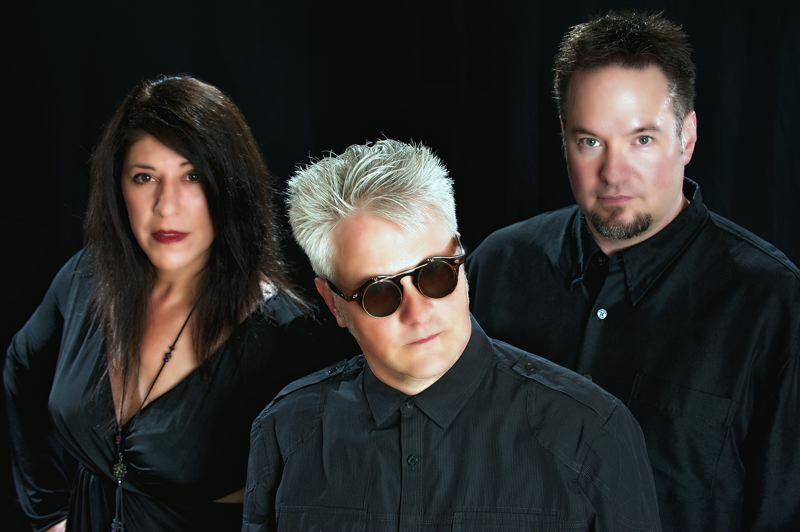 The high school sweethearts married in 1986 and continue to produce original music under the band name Here Comes Everybody. They live in Oak Grove with their son Emerson, who was born in 2005. “Denim & Diamonds” is the theme of Rex Putnam High School’s annual auction, planned for March 10. Proceeds from the event will fund a new sound system in the school gym and will also benefit the school’s sports teams, performing arts groups, clubs, and activities. To purchase tickets for the event or to make a donation, contact event organizer Julie Wood, a parent volunteer, by email at RPHSauction@gmail.com. René Ormae-Jarmer is available at 503-704-1934 and rene@herecomeseverybody.com, and more information about her can be found at renesdrumstudio.com. Here Comes Everybody, a band led by Oak Grove residents, is playing a free show at Ledding Library from 2 to 3 p.m. Saturday, Oct. 5.
by: SUBMITTED PHOTO - Here Comes Everybody members Rene' Ormae-Jarmer, Michael Jarmer and Steve Hale continue to glam up the local scene. Since 1986, the band has released several albums, opened for national acts, and played countless clubs, colleges and festivals. They are getting ready to finish up and release another new album, “The Play’s The Thing,” described as original, sparkly piano-pop-rock music set to William Shakespeare’s words. René Ormae-Jarmer is the drum-line director for Rex Putnam High School’s Kingsmen Thunder (See previous story, “Setting the tone for young musicians,” Jan. 31, 2012). Her husband, Michael Jarmer, is an English teacher there and this year released his first book, “Monster Talk,” about a second-grader growing up as a direct descendant of the monster created by his namesake, Victor Frankenstein. Here Comes Everybody’s new lineup features Steve Hale (Kashmir, RIA, Nu Wave Hit Machine, Steve Hale Trio) on bass. From its new wave, progressive rock beginnings, the band has evolved over the years, while sticking to its passion for “the memorable and delicious modern pop song.” It has been compared to the Beatles, Elton John, XTC, Suzanne Vega, Frank Zappa, the Muppets, Ben Folds, the Shins and the Flaming Lips. They’re playing another free all-ages show Nov. 1 at Cedar Mill Library in Portland from 7 to 8 p.m.
Go to link on KINGSMEN THUNDER Drum Line. Drum line to compete for the first time in HISTORY for N. Clackamas School District. Review of the latest HCE CD: "Play--Songs From Shakespeare"